Master storyteller, best-selling novelist and artist Michael O'Brien - the man to whom CNN went for comment on Harry Potter - has penned the definitive work assessing the Potter phenomenon. This book is essential reading for all parents whose children have read or are considering reading the wildly popular offerings by J.K.Rowling and similar works such as Stephenie Meyer's Twilight series. Although this is an analytical work, the reader will be captivated from the beginning, from the must-read preface onward. O'Brien's earlier work, A Landscape with Dragons, delineated authentic Christian fantasy literature from its counterfeits. Now in Harry Potter and the Paganization of Culture, he contrasts Potter-world with C.S. Lewis's Narnia and with Tolkien's The Lord of the Rings, and specifically Harry with Frodo. 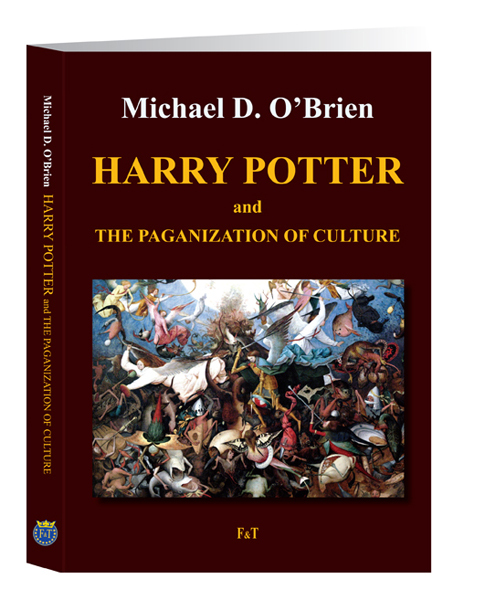 For those whose children have consumed Potter, O'Brien's analysis will enable parents to comprehend the messages which have been fed their children and give them the points and arguments which will hopefully be the antidote to properly reset their moral order. The book goes beyond Potter, however, to address other bestselling series such as Twilight by Stephenie Meyer and Phillip Pullman's The Golden Compass. In addition to these and other fantasy books, O'Brien reviews the films which they spawned. In all, O'Brien's new book teaches Christians how to discern harmless fantasy literature and film from that which is destructive to heart, mind and soul. "The corruption of Christian civilization's symbols is a centuries-old phenomenon, yet until the modern age the mutations and inversions, along with the making of new diabolic symbologies, remained on the fringes of society in secret societies and small esoteric cults. Now the culture of the cults is visible everywhere, and with the Harry Potter series is entering (and captivating) the mainstream. Through it, the corruption of symbols has moved to a new level of influence, and it has done so on a scale that is unprecedented in the history of literature. If we lose the language of true symbolism, we lose at a basic level of consciousness our way of knowing things as they are. Symbols are not items in some storage room or attic of the psyche that we can take up and discard at will, or rearrange without consequences. To tamper with them is to destabilize the very foundations of the house. While most Christians would never knowingly exchange symbols of evil for symbols of good, many have accepted a new realm of eclectic symbology that allows a mixture of good and evil symbols to influence their thoughts and feelings. But two contradictory symbol worlds cannot long remain in a state of peaceful co-existence within us. Either one or the other will come to dominate and will eventually demand the expulsion of the other." Harry Potter and the Gnostic Mind. Pope Benedict and Harry Potter. The Moral Compass or The Golden Compass? "I have long had serious reservations about the spiritual underpinning to the Harry Potter series. Like Michael O'Brien, I believe Catholic parents need to be alerted to the possible negative influences that these books can have on the moral and spiritual formation of their children. Any parent concerned about the formation of the character of their children should read this book." Master story-teller and artist Michael O'Brien-the man to whom CNN went for comment on Harry Potter-has penned the definitive work assessing the Potter phenomenon. This book is essential reading for all parents whose children have read or are considering reading the wildly popular offerings by J.K.Rowling and similar works such as Stephenie Meyer's Twilight series. Although this is an analytical work, the reader will be captivated from the beginning, from the must-read preface onward. O'Brien's earlier work, A Landscape with Dragons, delineated authentic Christian fantasy literature from its counterfeits. Now in Harry Potter and the Paganization of Culture, he fascinatingly contrasts Potter-world with C.S. Lewis's Narnia and with Tolkein's The Lord of the Rings, and specifically Harry with Frodo. For those whose children have consumed Potter, O'Brien's analysis will enable parents to comprehend the messages which have been fed their children and give them the points and arguments which will hopefully be the antidote to properly reset their moral order. The book goes beyond Potter, however, to address other bestselling series such as Twilight by Stephenie Meyer and Phillip Pullman's The Golden Compass. In addition to these and other fantasy books, O'Brien reviews the films which they spawned. In all, the author's new book teaches Christians how to discern harmless fantasy literature and film from that which is destructive to heart, mind and soul. I cannot recommend this work highly enough.